According to an article in the Wisconsin State Journal, Welton Enterprises, Inc. is one of two developers to submit a proposal for the long vacant 3.5 acre lot at 1402 S. Park St. which formerly held the Truman Olson Army Reserve Center. 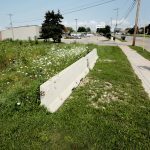 “They both bring a significant presence on Park Street and try to maximize the use of a deep and narrow site,” city real estate manager Matt Wachter said. Welton included two options in its proposal, the first is more expansive and requires more city funding, the second leaves out some of the RFP elements and requires less city funding. 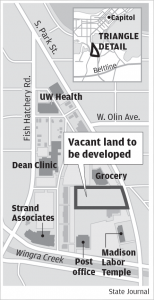 Both options include a 25,000 square foot grocery store and an apartment building offering low-income housing units. Welton also owns the adjacent Pick ‘n Save site, shown as “Grocery” left, and offers to work with the city in a second phase to redevelop that land. A committee of city staff will analyze the proposals and hold public meetings for the two interested developers to make presentations, the first of which is April 26th at 6:30 pm at Goodman Park Maintenance Facility.